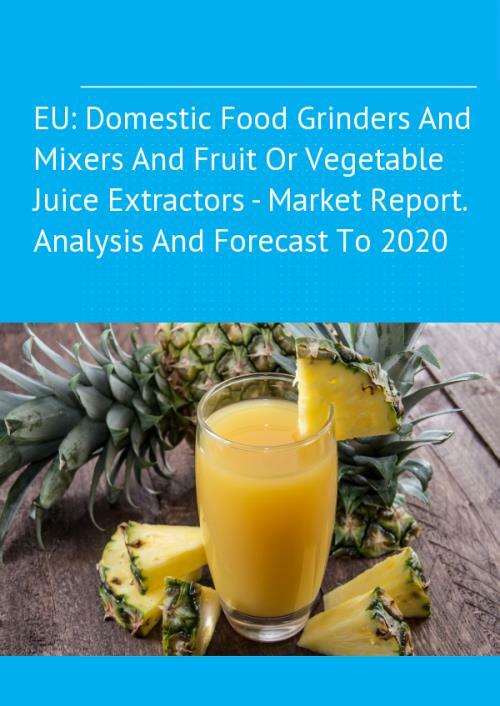 This report focuses on the EU food grinder market, providing a comprehensive analysis and the most recent data on its market size and volume, EU trade, price dynamics, domestic production, and turnover in the industry. The market trends section reveals the main issues and uncertainties concerning the industry, while the medium-term outlook uncovers market prospects. The attractivity index (IB Index) summarizes the source of existing opportunities as they appear in this market, as well as an interpretation of the trade figures. Domestic food grinders and mixers and fruit or vegetable juice extractors, with self-contained electric motor. Question What was the research methodology used for this report? 1.1 The collection and analysis of secondary market information. 1.2 Analysis of the materials received from market participants. 1.3 Study of financial and economic activity of market participants. 2.1 Analysis of materials provided by industry experts. Stage 3. Interpretation of research results, the preparation of the analytical report. 3.1 Cabinet work of professionals IndexBox Marketing (Desk research). 3.2 Quality control of the study results.